With our Technical Communication services, we can assist your users and clients to understand your technology and its benefits. We distinguish ourselves by delivering only high quality ahead of time so that all feedback is integrated as scheduled. 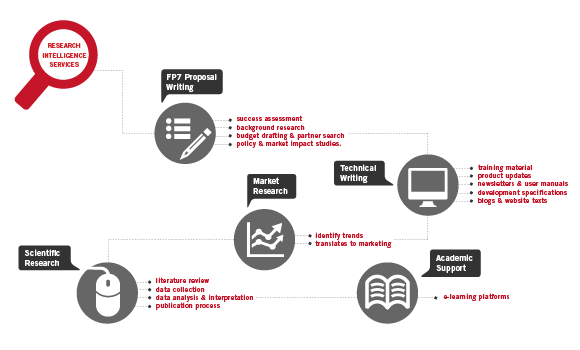 Proposal Writing: With ample experience, we assist in designing, writing and improving proposals including success assessment, background research, budget drafting, partner search, and policy and market impact studies. Technical Writing: Training material, product updates, newsletters, user manuals, development specifications, blogs and website texts as well as forum posts require the correct balance of technical information and targeted language. Technical texts can become powerful external and internal marketing tools when done correctly. Market Research: Consumer behavior has changed, especially with consumers becoming more conscious and selective during the economic crisis. Whilst they have more disposable income again, they know the tools to find the best quality at the lowest price. We can assist you to identify the important trends and how this translates to your product offer and marketing. Scientific Research: With a strong specialization in quantitative and qualitative methods, we can assist you in proceeding in the most scientific and efficient way when designing research, literature review, data collection, data analysis and interpretation as well as the publication process. Our thematic areas of expertise are IT and international trade. Academic Support: We assist Professors and Lecturers with creating the most beneficial curriculum for both themselves and their students. With our specific case study writing technique and in-depth knowledge of different e-learning platforms, we provide more than just teaching assistance.